All in a day, or night\’s work. The latest pastizzi batch fresh from the oven. They call it the shop that never closes. The sign outside says ‘Crystal Palace Tea and Coffee Bar’. This traditional little bar on the outskirts of Rabat, just around the corner from the Roman Villa and a five-minute walk from the entrance to Mdina, has been around for over 100 years. Its name is somewhat more recent – dating back around 60 years when it was a popular meeting place for British troops stationed in Malta. Owner Martin Azzopardi (known in Rabat as ‘Tas-Serkin’ – most families in Rabat have a nickname) took over from his father Ninu around 40 years ago. Indeed, the Crystal Palace hardly ever closes – you’ll always be able to scoff pastizzi (small, flaky pastry puffs filled with mushy peas or ricotta cheese) aplenty as the palace shuts for a mere two hours on weekday nights; Fridays and weekends, it’s open all night long – and this includes New Year’s Eve! Initially, the bar opened all night to accommodate British soldiers looking for a drink and something to eat round the clock. Once the forces left the islands, the bar still opened all night. Old habits die hard. This time, its nocturnal shift served local farmers bringing their produce to the pitkali market in Rabat in early hours of the morning for weighing and re-sale to local outlets. Once the market moved to Ta’ Qali, there was another reason for Cystal Palace to open all night – this time, party-loving students from nearby discos and all-night taxi drivers became its night-time clientele. Working at the bar, Martin sees the typical Maltese day go by over the course of 24 hours. As night becomes day, he sees the transition from night party-goers and night-shift workers to the very early risers going to their jobs and the first church-goers of the day. The freshly baked pastizzi, which Martin himself prepares at his nearby bakery, attract a number of memorable local regulars, an array of Maltese from other towns and passing tourists who are wooed by the tasty smell. Martin prides himself that his bar is one of the few, truly-specialised pastizzeriji left. He’s not remotely tempted to sell other or more expensive items on his menu, such as pizza, baked rice and timpana (a Bolognaise sauce pasta baked with a pastry topping). 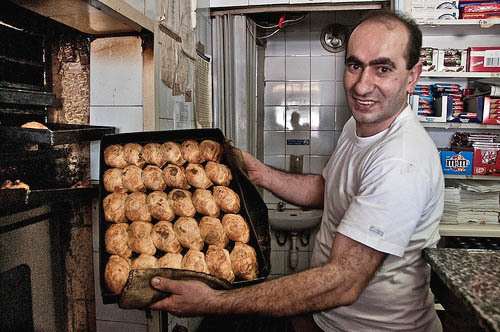 Over here, what you get is, quite simply and quite deliciously, traditional pastizzi and bread rolls. One regular customer, a young man from the other side of Malta, says he comes all the way here for the cheap and tasty food, the tea – in a glass just like his grandmother used to serve it – and good conversation with the lively and friendly characters who congregate in this historical bar and pastizzerija, all hours of the day and night. Crystal Palace Bar, Triq San-Pawl, Rabat. Christmas Eve – open til around 2pm most likely! New Year’s Eve – open til 4am! I can tell you how to make them,but it takes a knack I could never get. it my die with my mother who is the only one in my family left who can do it correctly. although my uncle has a shop in good. does anyone know how to make pastizzi, ricotta and pea pasties? Can t find one anywhere. Best memory of maltese holiday.